Nancy Haynes. Find Bearings Among Memories. 2016. Oil on Linen. 21.5" x 26"
Jill Moser. Sitings 2. 2014. Acrylic & oil on canvas. 30" x 30"
John Beech. Painting #138. 2018. Oil enamel, wood, canvas. 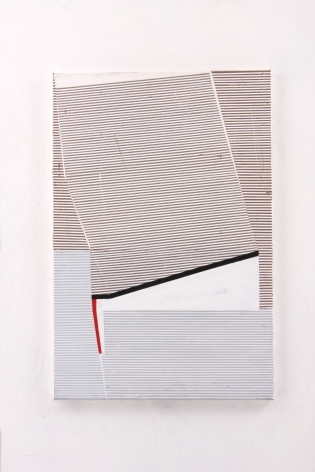 77" x 101" x 1 3/4"
Joan Waltemath. Breaking Lite. 2016-2017. Oil, graphite and fluorescent pigment on honeycomb aluminum panel. 20 3/16" x 39 5/16"
Gayle Ruskin. Montage. 2018. Oil enamel on wood panel. 60" x 48"
Gordon Moore. OVERNATE. 2018. Acrylic, Oil and Pumice on Canvas. 86"x57"
Michael Voss. Choque. 2010. Oil & gesso on linen. 15.75" x 12.5"
Oil, cotton, linen, organza, rabbit skin glue on canvas. 16" x 20"
Mary McDonnell. HIGHLAND FLING. 2017. Oil on Aluminum. 84" x 48"
Cora Cohen. Discursive Formation. 2018. Colored pencil, Flashe, and silkscreen ink on linen. 32" x 32"
Susan Smith. Red and Yellow Plasterboard with Blue. 2015. Found plasterboard with oil on canvas panel. 10 1/4" x 29 5/8"
Anita Rogers Gallery is delighted to open our fall season with a dramatic exhibition, DISCOURSE: ABSTRACT, organized by artist curator Gayle Ruskin. The exhibition explores varying aesthetic visions and interpretations of abstract painting by eleven artists living in New York City. It includes John Beech, Cora Cohen, Nancy Haynes, Lael Marshall, Mary McDonnell, Gordon Moore, Jill Moser, Gayle Ruskin, Susan Smith, Michael Voss, and Joan Waltemath. All of these artists have spent years perfecting their respective techniques with which to express their unique visions. Their works range from the gestural to the minimal, resulting in a dynamic synergy. "The coherence of the show comes from a shared command these artists display of both materials and process. One feels these works were chosen as much to create a discussion about the current state of abstraction as to provide a gateway into further exploration of each artist’s oeuvre."